Who Are the Policymakers and What Are Their Interests? Political actors and their interests are significant to policymaking. 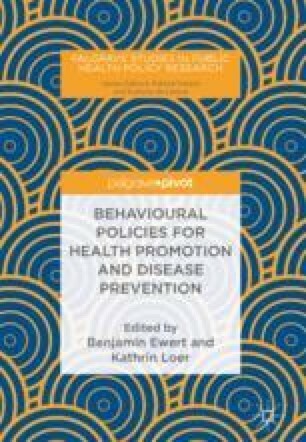 The chapter gives an overview of the most relevant political actors in public health. But the context of policymaking goes beyond visible political actors. Hence, in a second step the chapter shows which role scientific expertise plays and in what manner it plays this role. The way in which scientific expertise is produced and applied to policymaking by different actors is extremely important in order to understand agenda-setting, the hierarchy of specific policies in public health and ways of implementing those policies in different contexts. This chapter highlights and explains the high degree of complexity that characterises the relationship between policymakers and epistemic authority. Boseley, S. (2003). WHO ‘Infiltrated by food industry’. Available at: https://www.theguardian.com/uk/2003/jan/09/foodanddrink. Last accessed 4 Mar 2018. ILSI. (2016a). 2015 Member and Supporting Companies. Available at: http://ilsi.org/wp-content/uploads/2016/01/Members.pdf. Last accessed 3 Mar 2018. ILSI. (2016b). Code of ethics and organizational standards of conduct. Available at: http://ilsi.org/wp-content/uploads/2016/05/ILSICodeofEthicsSofC2009.pdf. Last accessed 3 Mar 2018. ILSI. (2016c). The role and activities of ILSI Europe. Available at: http://ilsi.org/europe/wp-content/uploads/sites/3/2016/05/ILSI-FREQUENTLY-ASKED-QUESTIONS.pdf. Last accessed 3 Mar 2018. ILSI. (2018b). Status of the new activity on ‘consumer behaviour determinants’. Available at: http://ilsi.eu/emerging-issues/. Last accessed 3 Mar 2018.